The swine flu pandemic of 2009 was one of the worst flu scares in recent memory, even if its actual effects ended up being relatively moderate. Now something unambiguously good could come of all this: a universal flu vaccine. As many as sixty million people were infected with the H1N1 virus, although only about 18,000 people are known to have died from the disease. What researchers are now discovering is what swine flu leaves behind: a superpowered immune system with antibodies that can kill off any new flu virus, not just a return of H1N1. Recent research on nine swine flu survivors revealed that the infection had caused all their immune systems to go into overdrive, creating a huge range of flu antibodies that aren't needed to fight off swine flu but would be very useful if any number of other flu strains tried to invade the subjects' bodies. More common flu strains like the seasonal flu or the very mild flu virus used to create the flu vaccine don't activate this many antibodies, suggesting there's something unusual about H1N1 that triggers this powerful immune response. The power of the H1N1 immune response is extraordinary. According to the researchers, five of the types of antibodies isolated in their research would be enough to fight off all seasonal flu variations, the Spanish flu virus that killed as many as 50 million people in the pandemic of 1918, and a potentially deadly bird flu strain known as H5N1. The researchers say the uniqueness of the swine flu is what triggered this response. 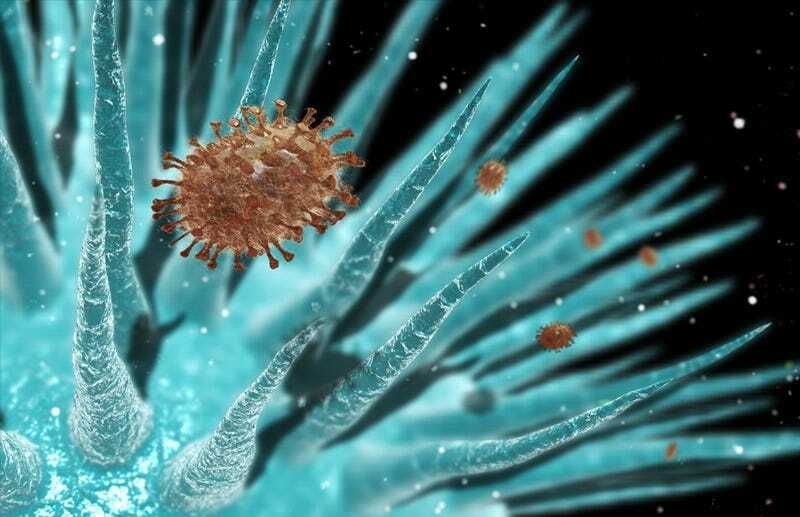 The immune system didn't immediately know what to do with the virus, so it started creating lots of different antibodies based on its memory of other flu viruses it had previously encountered. By the time the immune system found the right antibodies to fight off the swine flu, enough had been created to ward off all other influenza variants as well. We don't know yet whether the H1N1 vaccine also transferred these super immunity properties, although that's next on the researchers' to-do list. "Many scientists are working to develop a vaccine that would protect against the many strains of flu virus. This work gives us more confidence that it will be possible to generate a universal flu vaccine. It will take at least five years before anything like this could be widely available." Five years is a long time to wait, but considering that as many as 500,000 people die every year from various flu strains, it seems like a universal vaccine is very much worth waiting for.